From time to time Tenacres First School appears in the local press, or we have snippets of news that we want to announce. Any articles from our local papers appear with courtesy of the respective newspapers. 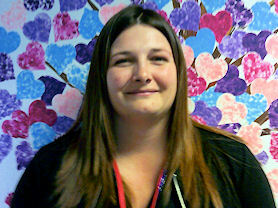 Lisa Sinclair, our Family Support Worker. At Tenacres we have our very own Family Support Worker, Lisa. She is based at school every Thursday. Lisa works with parents/carers and children on a range of areas routines at home, emotional well being or somebody to chat to and have some advice or to be signposted. Please pop and see Miss Marshall or the class teacher if you would like further information. 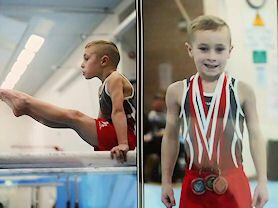 One of our Year 1 pupils is our superstar gymnast, and a future Olympian! 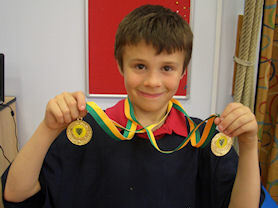 We wish him huge congratulations for doing so well in various gymnastic events in the National Championships. Everyone at Tenacres is so very, very proud of him. Our amazing collection for Newstarts. 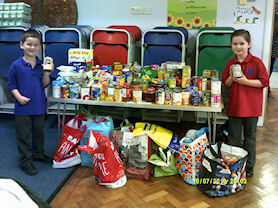 We were astonished at the amount of food items the school community sent in to support the charity Newstarts. The charity offers a range of support for families in Redditch. Tenacres was proud to help in this way. Thank you to all our families for yet again supporting us in this. Some of our sporting superstars. Congratulations to our children for their achievements outside of school. These include Dance, Gymnastics and Taekwondo. As part of our assembly theme this week we have been learning about what we can do to help preserve the Big Cats as part of World Wildlife Week. We are proud to say that Tenacres has adopted an African Lion and will fund his care to help protect the lion from poachers. We decided to have a reminder of this in our Jungle Library. 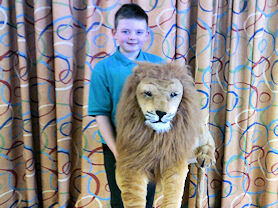 We had so many names from the children to choose from but we all decided on' Lemon Leo Lion'. 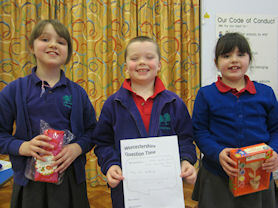 Four finalists in our Eco Code competition. As part of our re-accreditation process for the Eco Green Flag we launched a very exciting competition. We ask the children to write/design a new Eco Code for the school. Well done to all that entered and to our four finalists and the overall winner for his visual design. The winners of our competition. 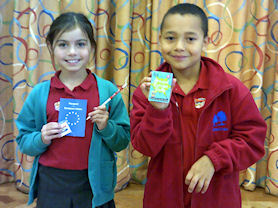 We celebrated European Day of Languages on Friday 20th October. 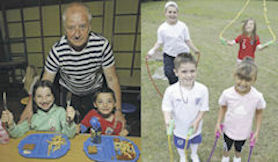 All the children spent time with children from different year groups experiencing a range of activities. These included food tasting, singing songs from around the world in various languages, dancing and craft activities. We also held a competition and children had to use their knowledge of Europe. Well done to our winners of this. This term some of our Year 3 children have been visited by Commando Joe! The after school club focussed on developing children's confidence, self esteem and resilience. 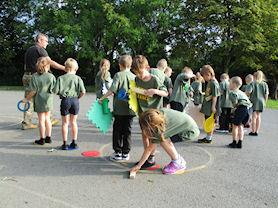 Each week the children had challenges to overcome and work as a team to solve. Celebrating achievements out of school. At Tenacres we are always eager to hear during our Friday Celebration Assembly about all the achievements our children make outside of school. These can range from Brownies, Beavers, Swimming, Gymnastics to even climbing Ben Nevis. Tenacres First School is celebrating its latest Ofsted report. 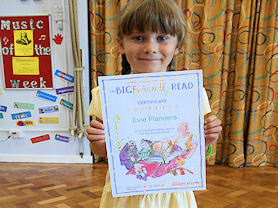 During the summer holiday the pupils of Tenacres were set a reading challenge being held by Redditch Library. This was part of our current whole school topic celebrating the life and works of the author Roald Dahl. Well done to our children for completing this challenge. 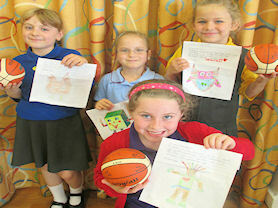 In the Summer Term, as part of our Paralympic topic we held a competition for our children to design a mascot. Jessica's was voted the overall winner and we have had the winning design converted into a graphic. The mascot symbolises everything that we value at Tenacres, and will soon be seen around school. 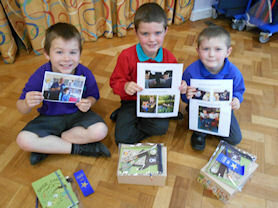 Showing off our photos of local landmarks..
Congratulations to our children for completing a Tenacres Reading Challenge. We asked the children to take photographs of reading their favourite book at a Redditch landmark. We had photos of so many places including the War Memorial, Forge Mill, Abbey Stadium, the Water Tower and many more. 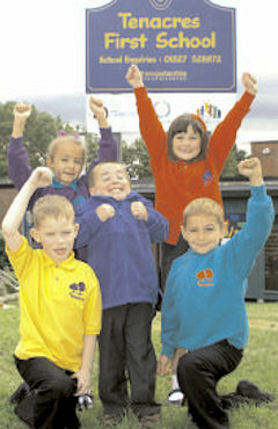 Staff and children at a Redditch school are celebrating after maintaining a 'good' Ofsted rating. Tenacres First School in Quibury Close, Winyates East, was recently visited by a government inspector. The report described the school as 'nurturing and supportive' and 'meticulous' in ensuring pupils and staff are safe. The school’ s wide range of extra-curricular opportunities were praised for giving pupils 'memorable experiences' and teaching was judged to be good. 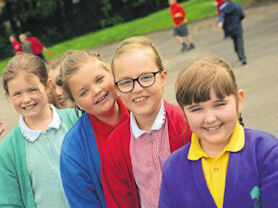 In the report, inspector Heather Simpson said: "Pupils enjoy school because teaching is effective. Teachers plan lessons that capture pupils’ imaginations and build on their previous skills. Pupils behave well and have positive attitudes to learning. They work hard and show good levels of resilience and determination in tasks. They are extremely polite and well-mannered around school. All adults act as positive role models for pupils and establish good and trusting relationships." Parents are overwhelmingly positive about the good quality of education and care their children receive. Typical parental comments include: "My children would come to school during the holidays if they could" and "Tenacres is a fantastic school". Head teacher Ceri Marshall said: "I am really proud of all the staff and children for continuing to make Tenacres a happy, nurturing successful school for our community." Areas given for improvement included challenging the most able pupils, especially in mathematics, reducing the gaps that exist between boys and girls, and disadvantaged children by the end of reception year and bringing the attendance of disadvantaged pupils in line with the national average. Our design winner and runners up. At Tenacres we have had an exciting competition to design our very own school mascot. As part of our whole school topic on the Olympics and the Paralympics children were asked to think of the values that are displayed at these events. In addition, to think of the values we have at Tenacres and use these to create a mascot. The mascot will feature around school to continue to promote the values. Well done to our overall winner. The winner and runners up received a signed basketball from the Paralympic 2016 Wheelchair Basketball Team. At Tenacres we encourage the children to complete practical projects for their topics at home. This has proved very popular with our parents and carers! 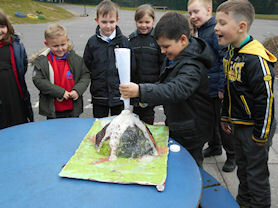 Take a look at the Year 3 project and a volcano that was made as part of their Dinosaur topic. We are pleased to announce that Tenacres has been awarded an Effective Practice Award by Worcestershire County Council. This is in recognition of the work and impact that the staff and children make in the following areas: School Council including Peer Mediation, Outdoor Learning Provision, Nurture and Support with behavioural, social, emotional and language needs. Our School Council is just one of the areas that promotes our British Values at Tenacres. The children are fully aware regarding the importance of Democracy, having a 'vote' and that their voice is heard. Our Peer Mediation led by our Helpful Heroes and Miss Rickard at playtimes and lunchtimes enables children to discuss and solve any problems they may have. Our outdoor learning provision reflects our belief that children effectively learn and are nurtured outside of the classroom and skills which may not always be seen within the classroom walls can flourish in the outdoors. 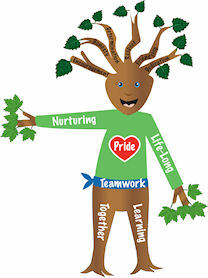 All children have Forest School Provision and it is very popular with our children. Our Starlight Room typifies our approach and ethos on the importance we place on nurturing our children. The curriculum including our PSHE provision acknowledges the 'whole child' and the development this requires. All staff at Tenacres ensure through every aspect of school life our children feel safe, secure and that their well-being is paramount. In order for children to access learning their emotional, social, behavioural, speech and language needs have to be central to their on going success not just at Tenacres but preparing them for life beyond. Again, we are very proud this has been acknowledged. Tenacres achieved the reaccreditation for the Eco Schools Green Flag Award last week. During today’s assembly we congratulated the Eco Committee for all their hard work led by our very own Eco Warrior, Mr Beacham. 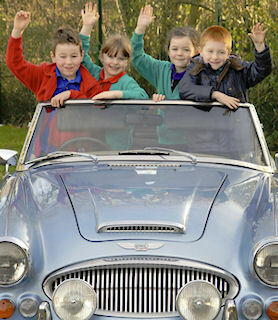 Youngsters from Tenacres First School were recently put in the driving seat as part of a special project. As part of a topic about transport and how pupils can be more eco-friendly, pupils got to enjoy a visit from Great Escape Cars. The company, based in Inkberrow, which specialises in renting vintage cars, taught them about how vehicles have changed over time. Staff also wore t-shirts with the slogan ‘Walk to School, Bike to School’ written on the front. They also took part in a YouTube music video, which will be played on BBC Hereford and Worcester. 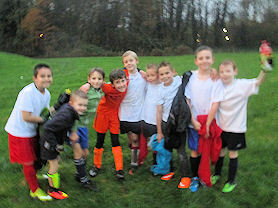 On Tuesday 25th November, nine of our Year 4 boys took part in a football match against Matchborough First School Academy, at Matchborough. Both teams played well, and were keenly supported by staff and parents. We are delighted to say that Tenacres won through fantastic team work and should feel very proud of themselves. Tenacres First School in Winyates is throwing open its doors and inviting prospective parents/carers and children to visit on Thursday 13th November from 10.00 to 11.00am or 1.45 to 2.45pm. Visitors will be able to see the unique rainbow uniform, spacious learning environment for Reception children and experience the excellent facilities to support effective teaching and learning, including a superb computing suite, specialist music room, sensory room, jungle library and two Forest School sites in extensive grounds. It is an exciting time at Tenacres with the recent redevelopment of outdoor spaces and complete internal refurbishment. Headteacher Miss Marshall says "Tenacres is a special place where the staff are dedicated to providing a stimulating, creative environment where everyone feels valued and safe, ideas can flourish and pupils can realise their full potential". The school has a very good reputation for its nurturing ethos and high standards of behaviour and achievement and were praised by Ofsted inspectors for their outstanding Foundation Stage provision. For more details you can contact the school on 01527 528872, email office@tenacres.worcs.sch.uk or visit www.tenacres.worcs.sch.uk where you can take a virtual tour. Our winning 'questioner' in London. "There was a competition at school where we had to write a question to the government, then a week or so after I had written my question Mrs Walters announced the winner in assembly. I was amazed when I found that I won. The question I asked was "How are the homeless and travellers counted in a census?". At the end of January 2014 Karen Lumley the MP visited my class 3R and answered lots of the classes questions. I had my photo taken with her. On the 21st October 2014 my Dad and I travelled down to London by car then took the Jubilee line to Westminster tube station. We met Monica the speech and language therapist for our school who took us into Parliament to meet the MP for Kidderminster Mark Garnier. We had a tour of the house and got to witness a debate in the house of commons. 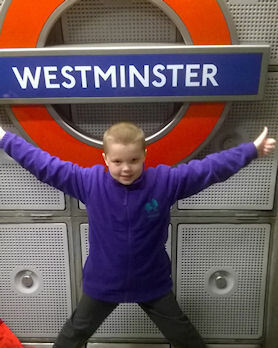 It was an exciting day out to be in the houses of Parliament and see some of London." 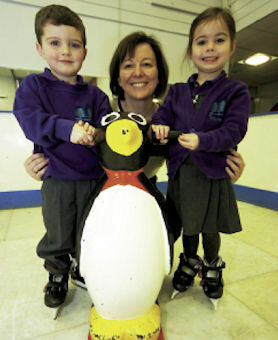 Two children get a helping hand from Pingu and acting headteacher Jeanette Walters. Picture by Jon Mullis. 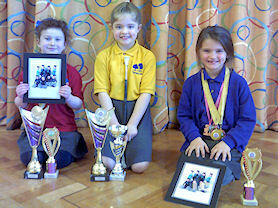 Children at a Winyates East school got their skates on to celebrate the Winter Olympics. A synthetic rink was installed at Tenacres First School last Friday (January 31) to mark the beginning of a topic on the Games, which begin in Russia today (Friday). Acting headteacher Jeanette Walters said: "At Tenacres we are constantly looking for ways to enhance the children’s learning experiences. We are exploring the new national curriculum to ensure topics are relevant and cross curricular, covering all subjects. You only had to look at the children’s faces to appreciate the impact it had on them. They will remember it for years to come." The children of Tenacres took part in 'Worcestershire Question Time', a competition in which the winner could ask our local MP, Karen Lumley, a really challenging question! The competition produced some fantastic questions; well done to everyone who took part. Here we have our winner and two runners-up. Choir members in St Stephen's Chuch. 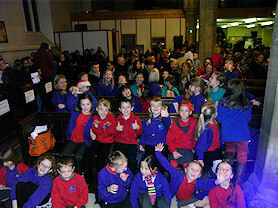 Members of the school Choir perfomed at the Redditch Carol Concert at St Stephen's Church on Thursday 5th December. On Tuesday 4 June, the Pearl Izumi Tour Series (cycle racing) hit Redditch Town Centre. We were delighted that one of our own pupils won the Under-10s Cycle Race, and can be seen in the photograph on the right proudly displaying his gold medals. Harvest harmonies were in the air at Tenacres First School during a special assembly. Parents of reception class pupils at the Quibury Close school were invited to hear children perform Harvest-themed songs. 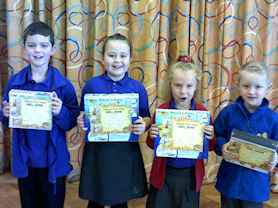 Teacher Becky Poynton said: "The children all had a great time and we had a really good turnout". Tenacres pupils with their new school uniforms. Tenacres First School welcomes the new school year with the launch of its unique approach to school uniform. Following pupil consultation it was agreed to offer children a choice of five colours, purple, green, red, yellow and blue, all with contrasting embroidered logos. The response has been phenomenal – parents and children love the range of colours and are mixing and matching. The updated logo reflects the outstanding outdoor provision at Tenacres and the nurturing ethos of the school. All children received a complementary reading book bag at the start of term to celebrate the launch. 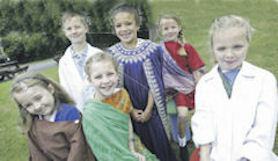 Miss Shillaker said: "We have all been thrilled with the response to our new uniform. As well as looking colourful and bright the children are expressing their individuality which boosts their self esteem and enthusiasm for school." Tenacres has also undergone extensive improvements and refurbishment over the summer holidays resulting in brighter classrooms, extended early years areas, a modernised hall/dance studio and extended office/reception area. Miss Shillaker invites visitors to come and see the new look Tenacres on their open day, Friday, 5 October 2012 from 9.00 to 11.45am or 1.15 to 2.00pm. Eastern dance moves at Tenacres First School. 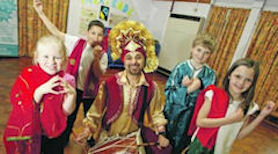 Children at Tenacres First School in Redditch were moving to a different beat recently when they had a visit from a trained Bollywood dancer. Sohan Kailey from Aashiyana Arts spent a day working with pupils from year three, before they staged an afternoon performance of their own for children in reception. Kate Wells from Tenacres First School, said: "Both the children and the staff thoroughly enjoyed the day." Children from Tenacres with MP Karen Lumley. 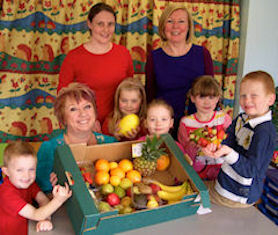 As part of 'Fruity Friday' celebrations at Tenacres First School, children had the opportunity to learn more about eating healthily and take part in 'fruity' activities. The school council organised a fruit drawing/painting competition with prizes for the best entries which Karen Lumley MP took time to judge, picking winners from each year group. Children also attended school wearing the colours of their favourite fruit and at lunch time there was a competition to see who has the healthiest lunchbox. The school has been lucky to receive donations of a range of unusual and exotic fruits from Total Produce. Mrs Lumley said: "It was great to see the enthusiasm of the children taking part in various arts and crafts activities and trying out unusual fruits for the first time. It was a tough job judging the art as there were several impressive drawings to consider." Taking a look at planet earth. Picture by Marcus Mingins. There was plenty of star gazing at Tenacres First School as children came face-to-face with the universe. 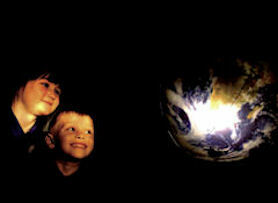 Staff from Hereford Starlab brought their mobile planetarium to the Quibury Close school which gave pupils the chance to get up close with the solar system. They also experiment-ed with making rain-bows and learnt about how the Ancient Greeks interpreted the stars. Later in the week, staff and pupils were trans-ported back to 1969, donning clothes from the period and tucking into a meal including instant mash, before sitting down to watch the moon landing. The activities were part of work children have been doing on space. Suits you - Tenacres Fashion Club members show off their latest creations. Picture by Marcus Mingins. Creative fashionistas from Tenacres First School have been showcasing their work on the catwalk. The Fashion Club launched their Design and Technology Week with a fashion show after the Key Stage 2 pupils worked hard after school to create their own designs. 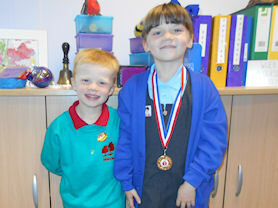 Teacher Carol Fisher said: "We have been overwhelmed by the enthusiasm of our children and by their innovative ideas. We are grateful to have had support from GCSE students from Arrow Vale and A-Level students Gemma Gilmore and Amiee Shanks who have volunteered in their own time." 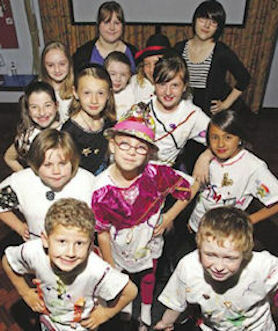 Youngsters from Tenacres First School take to the catwalk. Pupils at Tenacres First School launched their Design and Technology Week with an exciting fashion show. Pupils from key stage two have been working hard using a range of skills to create their own designs during an after-school fashion club. Club co-ordinator Carol Fisher said: "We have been overwhelmed by the enthusiasm of our children and by their innovative ideas. We are grateful to have had support from GCSE students at Arrow Vale and A-level students Gemma Gilmore and Amiee Shanks, who have volunteered in their own time." Keeping fit bouncing balls. Picture by Marcus Mingins. Tenacres First School was a hive of activity as pupils skipped and bounced in aid of charity. The pupils’ council thought up the idea of having a Feeling Fit Friday in aid of the British Heart Foundation and each child chose one of three activities - skipping, bouncing or catching - and were timed for one minute to see how many they could do. 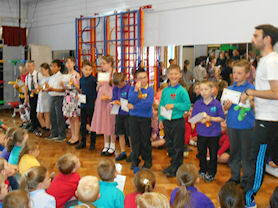 Everyone took part and prizes were given out for those who raised the most sponsor money. Dads at school, and keeping fit. 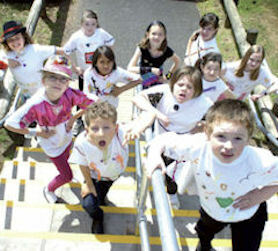 Youngsters at Tenacres First School had fun while keeping fit and helping a worthy cause. Feeling Fit Friday was thought up by the pupils’ council and aims to promote healthy living and keeping fit. It was a sponsored event and the money raised will be donated to school funds and the British Heart Foundation, a charity chosen by the pupils. The youngsters had to choose one of three activities – skipping, bouncing or catching. They were timed for one minute to see how many they could do. Prizes were given for those who raised the most sponsor money. Last week, the school also treated dads for Father’s Day. They were invited to school to spend time with their children and to enjoy some lunch with them. Youngsters at a Redditch primary school showed just how much they’ve grown and learnt over the last year with a special event for parents. Tenacres First School hosted an assembly entitled The Little Seeds recently which all parents were invited to go along and enjoy. During the event, youngsters got to demonstrate a variety of things they have learn over the last 12 months and entertainment included children Bollywood dancing and singing songs in French.